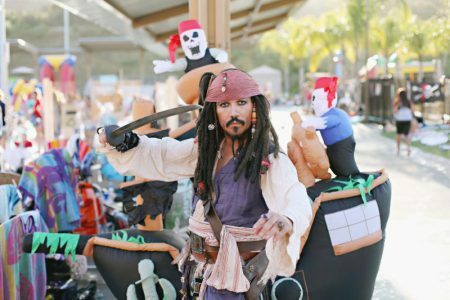 Enjoy pirate themed pool activities and games during the City of Carlsbad’s annual Pirate Plunge event at Alga Norte Aquatic Center at 6565 Alicante Road, Carlsbad, California on Saturday, April 29, 2017 from 5 to 9 p.m.
Come dressed in a swimsuit and enjoy the fun, swashbuckling activities which include diving for treasure, cannonball crush, hook it, ship raider race and more. Dry land activities will include a treasure hunt, pirate ship slide, a tropical bounce house and photo opportunities. As the sun goes down, finish the night off with a special presentation of the movie, The Wild Life (PG), on the giant outdoor movie screen. Cost is $10 per person. Children ages 3 and under are free. Advanced purchase is recommended and as a courtesy, wristbands may be picked up in advance through April 29 during regular business hours at Alga Norte Aquatics Center only. Enjoy dinner at the Dive In Grill which is open during the event. The menu includes made-to-order grilled burgers, chicken sandwiches, pizza, shaved ice, ice cream and other tasty treats. For more information, call 760-268-4777.